From February 9-12, 2010, the city will be treated to Monodrama Manila, a festival of outstanding works in this little known genre. 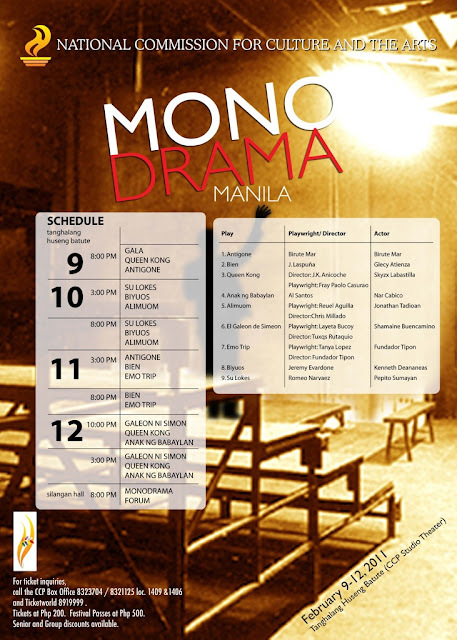 Organized by the National Commission for Culture and the Arts in cooperation with the Cultural Center of the Philippines, Monodrama Manila is a showcase of this unique theater form, one where a single actor takes on several roles. Eight local and one international group are taking part in the festival. Outstanding thespians join award winning playwrights and directors and bring life to new works. From the National Capital Region are Shamaine Centenera-Buencamino in Layeta Bucoy’s Galeon ni Simeon, Glecy Atienza in J. Laspuna’s Bien; Nar Cabico in Al Santos’ Anak ng Babaylan; Jonathan Tadioan in Reuel Aguila’s Alimuom and Skyzx Labastillas in Fray Paolo Casurao’s Queen Kong. The Visayan entries are Tanya Lopez’s Emo Trip featuring Adelyn Maloloy-on and Jeremy Everdone’s Biyuos with Kenneth Deananeas. The lone entry from Mindanao is Su Lokes by Romeo Narvaez featuring Sybil Alvarez. These local entries will be joined by a special performance of Sophocles’ Antigone by Birute Mar, an outstanding thespian from Lithuania. In addition to the various performances, a forum on the Monodrama will be held on February 12, 5:30pm at the Silangan Hall. Note: The Gala Performance on February 9 is by invitation only. Tickets are priced at Php200. Festival passes are available at Php500.00. For inquiries, please call the CCP Dramatic Arts Division at (632) 832-1125 loc. 1606/1607.